Kuala Lumpur, September 2014 – David Blaine, the popular magician has come over to Malaysia a few days ago to have his first show here titled David Blaine “Real or Magic” Asia Tour Live In Malaysia. Our team from wljack.com & loong-updates.blogspot.com have been given an opportunity to do a coverage on the marvelous show! Bringing Top-Notch Street Magic To Malaysia! Close-up Interaction With Fans! Being one of the most prestigious illusionists in the world, David Blaine has brought us his prominent acts to Malaysia, Street Magic! As most of us know, most street magic involves the interaction between the magician as well as the audiences. Maintaining the tradition of street magic, David Blaine has done most of his acts with the presence of selected lucky fans. All these fans were given the golden opportunity to experience first-hand the tricks done by their favourite magician! Opening Trick: Playing With Fire & Water! Excited Fans Selfie On Stage With David! The first trick done by David Blaine was related with fire and water. He has chosen 6 lucky fans from the floor to go up on stage along with their own bottle of water. He then effortlessly drank up all 6 bottles of water (3 liters of water) without feeling any discomfort. While he was drinking the water, the lucky fans were very excited as they kept on posing and taking selfie with David Blaine on stage. After he drank up all the water, he then drank another bottle of fluid which is highly-combustible. Guess what happened next? He breathed out fire from his mouth and ignited the logo “db” on the stand which was placed on stage! After the heat was started up, he extinguished the fire with 3 liters of water coming out directly from his mouth! It was really amazing and it was really unbelievable on how he could manage to store that much amount of water within his stomach! Card Tricks & Puzzle Trick! Brilliant Moments Of David Blaine With Fans! Apart from the opening trick, David Blaine has actually continued his interaction with fans throughout the following tricks he played. Card Trick is something very common in street magic but it is at a totally different level when it was performed by David Blaine. Interacting with fans, he smoothly did the card tricks right in front of the fans. Despite being at a very near distance, all of his tricks were successful and all of the selected fans fell straight into the illusions he created. Of course, David Blaine was not stingy in sharing his skills as he actually demonstrated slowly to the crowds regarding his trick and he has actually revealed the method in performing one of his card tricks! The most astounding moment was the time when he asked the fans to pick one out of thousands of puzzle pieces from a bowl and it was miraculously matching with the missing piece on the already completed puzzle! The puzzle was a map and the missing piece is coincidentally Malaysia! David was generous enough to give the props used during his tricks to the lucky fans! Getting Stabbed With No Blood! Is That Even Possible? David Blaine is famous for being able to do stunts that were beyond logical explanation. During this show, he has requested a fans to stab his hand with a sharp ice-pick! Did the fans really stab him right straight into his hand? Hopefully he would be doing the same act again in his next stop for his Asia Tour and you could find out more during those shows! He then went to the backstage while the stage was taken over by his guest performers! Guest Performers Did Their Best To Impress Too! While David Blaine’s performance was undeniably impressive, the guest performers’ acts were equally astonishing too! First guest performer was Salah Benlemgawanssa, who is a dancer from France. He has shown to us a set of jaw-dropping pop-locking dance which has wowed all of us! On the other hand, Yann Frisch who is famous for his juggling magic act has nonetheless provided us with some laughter in the show. Last but not least, the host of the show Todd Robbins was the final guest performer for the show. He asked the crowd whether they would prefer a card trick or a more violent act that might not be suitable for the minor. The audiences actually preferred the violent ones. And yes, he then showed us a few danger acts such as glass eating, hammering nails into nose and etc. All of these really gave the audiences some spine-chilling feeling and all of us felt amazed with his great effort! Record Breaking Moment By David Blaine! 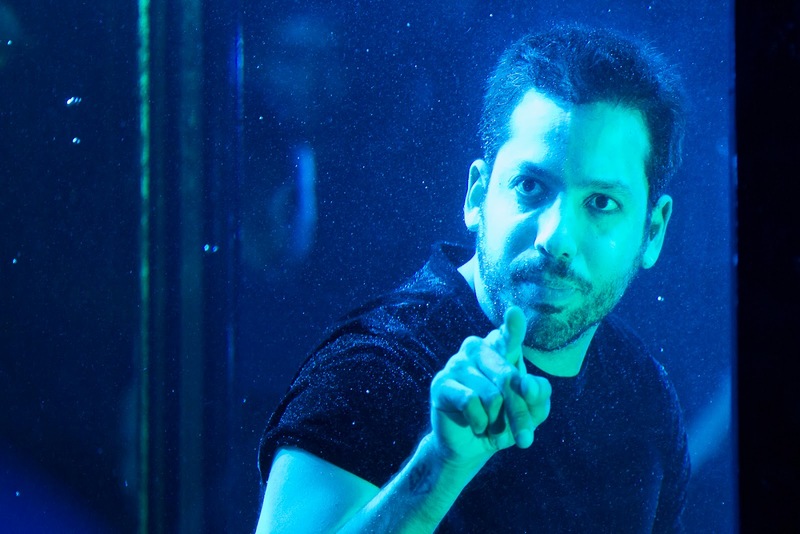 The most unforgettable moment during the show was during the time when David Blaine submerged himself into a tank of water to break his record for being in the water without any oxygen supply. We can feel the adrenaline rush as we witness the special moment together. Some of the opportunist fans have actually walked near the tank to take selfie with David. A female fans even entered into the tank itself temporarily to experience what David Blaine was experiencing. The moment of joy has come as David Blaine has actually broken the record with “8 minutes 36 minutes” endurance inside water without oxygen! That’s the end of the show. It was indeed a fascinating night with great magical performances as well as a memorable record-breaking moment! Million thanks to LOL Events & Livescape Asia for bringing David Blaine to Malaysia and thanks for giving our team a chance to do a coverage on the wonderful magic show! Credits to the official photographers for the pictures.